CIMT is a new noninvasive ultrasound test that is being recommended by the American Heart Association and the American College of Cardiology to screen for heart disease in apparently healthy individuals. CIMT stands for Carotid Intima-Media Thickness. Studies have shown a high correlation between the carotid artery IMT and coronary artery disease. Procedure: This is a noninvasive test which is performed with a high-resolution B-mode ultrasound transducer. The test is safe, painless and takes about ten minutes. The test measures the thickness of the inner two layers of the carotid artery – the intima and media – and alerts physicians to any thickening when patients are still asymptomatic; which means before symptoms are present. An abnormal CIMT test may indicate the need for a more aggressive approach to managing the risk factors associated with heart disease and stroke. The carotid arteries provide a “window” to the coronary arteries. Not only do they have similar risk factors – more importantly, the relationship between the atherosclerotic burden in a carotid artery and a coronary artery is the same as between any two coronary arteries. Thus carotid atherosclerosis provides a window to the degree of coronary atherosclerosis in an individual. The CIMT is an independent predictor of future cardiovascular events, including heart attacks, cardiac death, and stroke. The CIMT report will tell you and your physician your vascular age. If your vascular age matches your chronological age or younger, then you have a lower risk for heart disease. If your vascular age exceeds your chronological age, then it alerts your physician to be more aggressive at controlling those risk factors associated with heart disease. Importantly, with various therapies, it is possible to achieve regression or slow down progression of the CIMT. A follow-up CIMT is done six months to a year after therapy is initiated to evaluate the effectiveness of those therapies. Physicians use CIMT testing to determine the “age” of the carotid arteries. Knowing that patients may not be experiencing the symptoms of artherosclerosis, there still may be subtle changes in artery thickness. Armed with this information, physicians may develop an aggressive medical approach by prescribing medications such blood pressure and cholesterol lowering agents and aspirin, and patients may also be encouraged make lifestyle and dietary improvements. 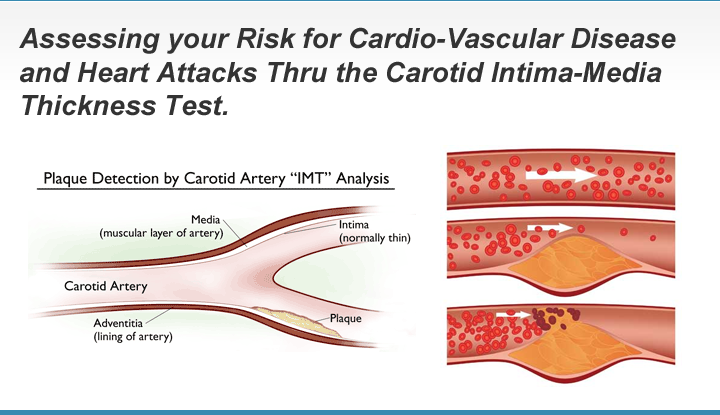 Watch a short video about Carotid Intima-Media Thickness Test and how we screen for it.